A new world-class residential and commercial development will be built on the south bank of Parramatta River following DA approval from the Sydney West Joint Regional Planning Panel (JRPP). Riverside Tower is a joint venture between Parramatta City Council, property and private equity firm LIDIS and venue managers Dockside, and is the latest addition to the construction boom that is changing the face of Sydney's CBD. Lord Mayor of Parramatta Cr Scott Lloyd said, "This will be an iconic development for our city and a major step forward in the Council's plans to revitalise the Parramatta River foreshore. ""Riverside Tower is a significant project in a critical location on the river right on the door step of our popular 'Eat Street' dining precinct. It will deliver a range of economic, social and environmental benefits to the community. ""It is estimated around $13-14 million in extra revenue will be generated per year for restaurants in the vicinity, with the Conference Centre adding another $20 million annually to the local economy," he said. 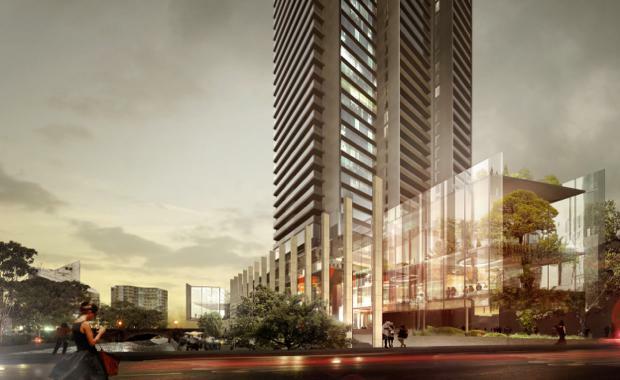 When completed, the mixed-use development will offer 413 luxury residential apartments spanning 41 storeys plus retail, entertainment and conference facilities. More than 4,400sqm of public domain and foreshore land will be upgraded as part of the project. Riverside Tower is part of an $8 billion pipeline of construction projects in Parramatta which under the State Government's Metropolitan Planning Strategy, is now recognised as Sydney's dual CBD with the same status as the City of Sydney. A main feature of the development will be the proposed Council-owned exhibition centre, which aims to deliver a spectacular entertainment and dining experience that is befitting Council's plan to build Australia's next great city. The centre will provide new business opportunities for tourism operators, hospitality and accommodation providers, along with the adjoining conference and event centre. Operated by Dockside Group, the conference and event centre is set to house the CBD's largest function space with 1,000 guest capacity in its pillar-less ballroom. Both the exhibition and conference centres are registered with the Green Building Council of Australia.